Roj Ashtad Mah Fravardin, 1383 Yz. After the murder of Padshah Navdar by Afrasiab, the Mobed Council of Iran met, under the guidance and leadership of Zaal. How were the Kings of old appointed? Was it merely a father to son succession? No. The first and most important requisite of the Padshah was the possession of the special halo, or Khoreh, called Farrah Yazadi which indicated his divine right to rule. The presence or absence of the Khoreh was determined by the Mobed Council – a group of the senior most and spiritually far advanced seers of the realm. When there were two or more claimants to the throne, the Mobed Council would devise a series of tests for the contestants and based on their performance, announce who would take over as the King. It was in such circumstances that the Mobed Council met, under the overall leadership of Zaal. Even though Navdar had two sons – Tus and Gastahem, they were too young and more importantly, neither of them possessed the Divine Aura of Kingship. Finally after deliberations, the Council decided that Zav should be appointed as the new Padshah. Zav, a man of advanced age, was a saintly person, mostly involved in prayer and meditation. He stayed away from the rough and tumble of daily life. He derived his lineage from Faridun in the following manner: Zav – Aga Isvak – Tahmasp – Minocher – Irach – Faridun. The decision of the Council was conveyed to Zav by the noble Kaaran. Zav agreed, came out of his seclusion and ascended the throne of Iran. Zav was an extremely advanced soul and a Master of Nirangs. Much like his illustrious ancestor Shah Faridun – whose Nirangs are used even today, there were many Nirangs written by Zav, some of which were later on appropriated by holy men of other religions which came to Iran. During this time and prior to his rule, Iran was going through a severe drought, the rains having failed for nearly seven years. Although the official granaries had been opened free of cost for all, there was a great danger of starvation. In these circumstances, King Zav undertook a great spiritual endeavour. He performed a special prayer and Amal of a secret Nirang, which caused an increase in the roaring of animals like lions and tigers in the forest. The roaring of such animals produces a special red coloured vibration (Staot) which hastens the advent of rainfall. Within a short time of this Amal, there was adequate rain throughout Iran and the catastrophe was averted. These fantastic details were revealed to us by our Master, Ustad Saheb. Meanwhile as the country prospered, King Zav also gave the order to his soldiers to liberate all of Iran from any Turanian influence. Under the leadership of Zaal, the few remaining Turanians were pushed back and soon, Afrasiab had to retreat behind the Jayhun river and accept the old boundaries between Iran and Turan. This was a great disappointment to Afrasiab and one of the most important achievements of Zav. 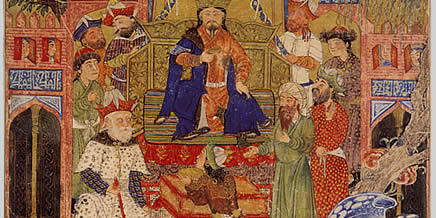 On the Turanian side, the murder of Agreras by Afrasiab had split the royal family and de-motivated the Turanian army. 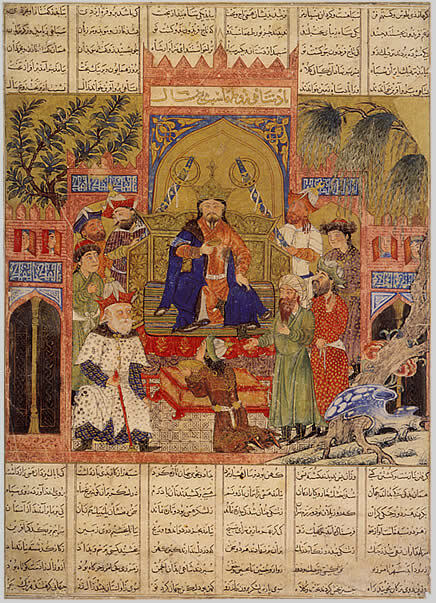 King Pashang refused to even meet or see the face of his son Afrasiab. So from all sides, it was a time of great defeat and disappointment for Afrasiab. After a reign of only five years, Padshah Zav passed away at the ripe age of 86. The Mobed Council appointed the son of Zav, called Keresasp as the new ruler of Iran. Keresasp had a relatively uneventful reign of nine years and passed away. Now when Keresasp passed away, there was no person with the Farrah Yazadi – the Divine Kingly Right to rule. There was consternation in Iran as to who should be appointed. When news of this hesitation reached the ears of Afrasiab, he became active once again. His old enmity arose in him and clouded his vision. He began to make fanciful plans to invade Iran and take over the whole empire for himself. Over the 14 years that had passed since the murder of Agreras, the disposition of King Pashang towards his wayward son had also changed. Coming under the influence of Afrasiab’s guile and talk, King Pashang agreed to raise an army to cross the Jayhun river and attack Iran. When news of this development reached Iran, there was great fear and confusion. Zaal was summoned from his semi-retirement state in Zabulistan and asked to gird his loins once again to preserve the unity and integrity of Iran. But at this time, it was Rostam who stood up and demanded that he had had enough of a childhood and it was time that he should go into battle. Even though Zaal knew the spiritual stature of Rostam, as a father he was perhaps, over protective and tried to discourage Rostam. But Rostam was adamant and finally Zaal relented. But as a warrior, there were two things which Rostam needed the most – the best armour, and a fine horse. And he had neither! Due to the huge size and excessive weight of Rostam, no horse could be found that could bear his heavy burden. Many tried but broke their backs the moment Rostam sat on them! Finally, Zaal called on his spiritual advisor – the Simorgh for help. The Simorgh appeared and coached Zaal and Rostam into the mysteries of his great and illustrious future. The Simorgh made Rostam perform four deeds. Firstly, the Simorgh Abed made Rostam go through a series of spiritual developments, or Amal. These exercises toughened Rostam’s body even further and ensured that he would never get injured, no weapon could harm him. Due to the special prayers of the Simorgh, three divine entities stood over Rostam at every moment of his life: On and over his head was Dami Upaman – the Divine Wisdom to ensure cleverness and right choice in the time of battle; Sherevar Ameshaspand on his right shoulder – to give Divine Power and the Righteous Authority to wield weapons in the name of God; and on his left Behram and Ama Yazads, to provide incredible divine bravery and valour. What a combination! Thus armed spiritually, the Simorgh advised Rostam as to how to procure the armour for himself. some kind of feeling as to wanting to know how this all must have happened. I wish there would be a movie on Rostam Nameh which I could see and show it to my boys.Ths for every info which you share with us.Waiting to read more.